Takes 8 Minutes , serves 4. For the classic – Toast and butter the bread. Arrange sliced radish in an attractive fashion, sprinkle with salt and serve. For the WATC version - Toast the bread and add a generous helping of ricotta cheese, smoothing it evenly across the toast. Add a sprinkle of microgreens before arranging the sliced radish in an attractive fashion. Sprinkle with salt, chopped chives and black pepper before serving. Two deliciously flavoured ways of serving thinly sliced garden-fresh radishes on beautiful breads? 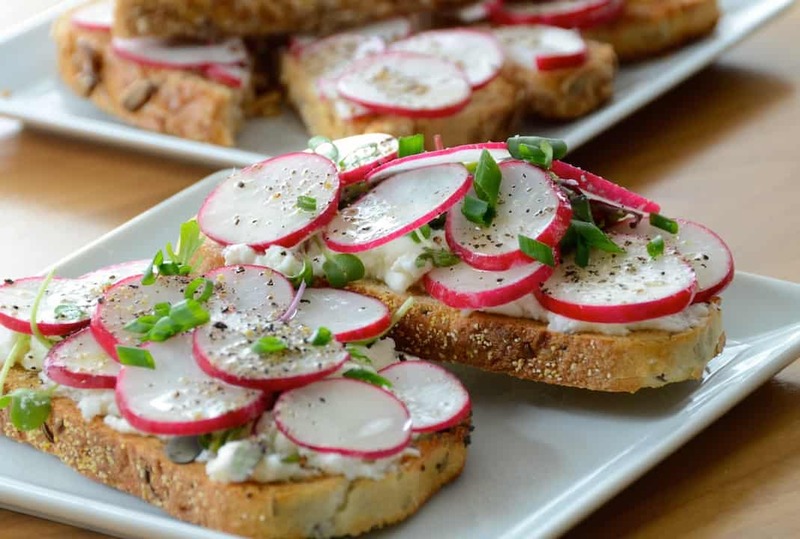 Make RADISH TOAST TWO WAYS today! Every once and a while you come upon a recipe that seems remarkably simple, yet when you taste it, it exceeds every expectation. RADISH TOAST TWO WAYS is something we really think everyone should try. 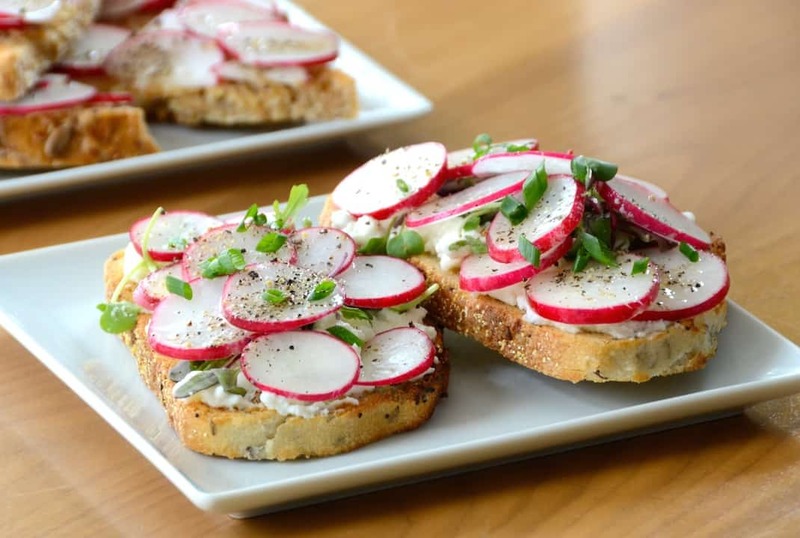 While testing the classic version – thinly sliced radishes arranged on buttered toast with a sprinkle of kosher salt – we were captivated by the simplicity and pleasing presentation. One bite and we knew why this simple treat has become so beloved in its country of origin, France. We then thought we’d enrich this post by also offering our take on the concept, and with just a few small tweaks to the original, we think we’ve created something equally worthy of your attention. THE RADISH – North American foodies are probably most familiar with Cherry Belle radishes with their bright white flesh and vibrant red skins. Although these may be the most readily available, don’t think of them as your only option. Check out the excellent article at GARDENING KNOW-HOW that lists a slew of different types of radishes to make your culinary pursuits even more enjoyable. THE BREAD – The original bread used to make this recipe is French baguette, with the option of toasting it beforehand. We think the bread used should be left to the maker – try the recipe with seed bread, multigrain, rye, whole wheat, gluten-free or any other bread that suits your fancy. Just make sure it’s freshly baked. THE CLASSIC – The classic involves taking your favourite fresh bread, toasting and then adding butter before you layer thin-sliced radish and nothing more than a sprinkle of kosher salt and black pepper if you wish. We are so impressed with the flavour of this no-nonsense flavour combination and suggest you think about serving it for breakfast, lunch, brunch or an afternoon snack. OUR VERSION – Our version came together using a fresh bread made with onion that we toasted before adding a substantial layer of light and fluffy ricotta cheese, then added a tiny sprinkle of flavour-forward assorted microgreens, the sliced radishes, salt, a sprinkle of chopped chives and fresh ground pepper. It might not seem like a big difference from the classic, but trust us, the flavour is fantastic! Looking to pair our RADISH TOAST with something equally enjoyable? How about our chilled GAZPACHO SOUP or, our SLOW COOKER CORN CHOWDER. We love the idea of a soup and sandwich pairing. 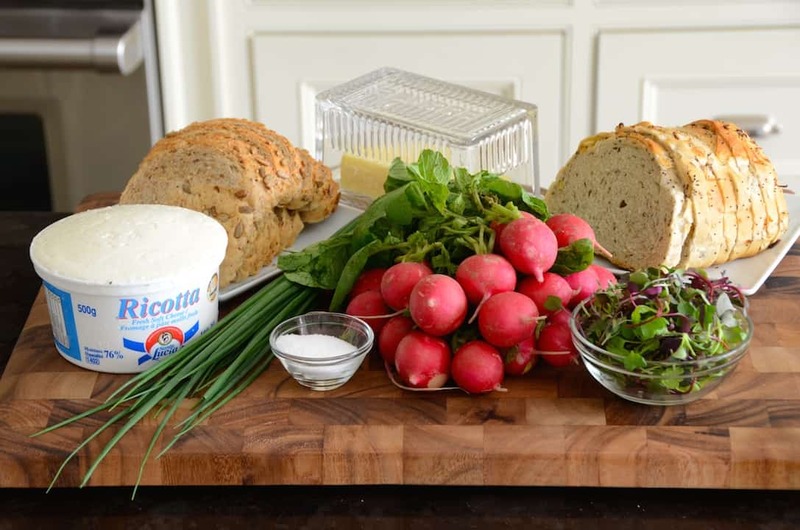 A short list of ingredients comes together to create an enjoyable treat – RADISH TOAST TWO WAYS.